A ROCKET successfully launched on Sunday from NASA's former moon mission pad is taking supplies to the International Space Station. 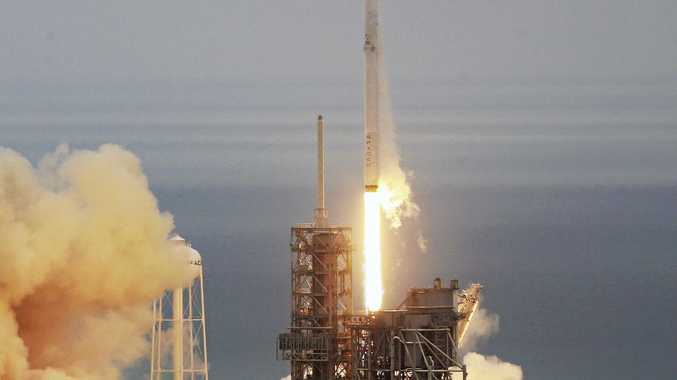 Eager crowds at Kennedy Space Center, where astronauts embarked for the first lunar landing 48 years ago, watched as the unmanned Falcon 9 SpaceX rocket took off before disappearing in clouds 10 seconds later. Several minutes after lift-off, the booster rocket landed back at Cape Canaveral. As when the Space Shuttle landed, sonic booms accompanied the booster's return. The 15-storey booster landed upright at its designated spot at Cape Canaveral Air Force Station. SpaceX head Elon Musk celebrated. "Baby came back,” he tweeted. The Dragon cargo ship went into orbit a few minutes later. It will reach the space station tomorrow with 2500kg of food, clothes and equipment for experiments. It follows India's record launch last week of 104 satellites - weighing from less than 10kg to 714kg.